To the left of Piazza Cahen stands the Fortezza dell'Albornoz, built by order of the Spanish Cardinal Albornoz under Pope Innocent VI and according to the designs of the condottiero and military engineer Ugolino di Montemarte. 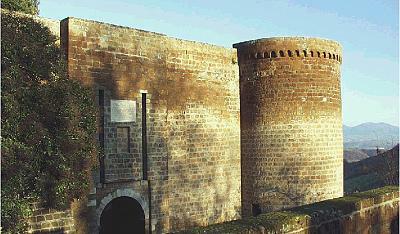 The Albornoz fortress stands on an area that was once occupied by a temple, known to archaeologists as the Augurale, in Etruscan times. Originally known as the Rocca di San Martino, construction on this massive fortress started either in 1359 or 1353, by order of the Papal legate Cardinal Egidio Albornoz, near the townï¿½s cemetery, over an area that had been occupied by a number of important buildings. The idea was to make the city a secure hold for the Church, thereby enabling the Cardinal and his captains to consolidate their recent military victories. The square plan of the fortress was flanked by a small building near the main entrance, surrounded by a moat and accessible only via a drawbridge. But the Rocca was almost completely razed to the ground in 1395 and successive attempts by Pope Boniface IX and Pope Martin V proved unsuccessful, until the mid-15th century when the fortress was rebuilt on the original plans and given added protection by a circular line of fortifications. After the Sack of Rome at the end of 1527 Pope Clement VII took refuge in Orvieto. To ensure that the city would be sufficiently supplied with water in the event of a siege, he gave orders for the digging of the well-known artesian well known as the Pozzo di San Patrizio (1528-1537). The pope also ordered that a second well be dug to supply the fortress alone, adding to the cistern built initially for the fortress in the 13th century. Antonio da Sangallo the Younger was commissioned to dig the main well and establish which underground springs would supply it. The restoration works carried out on the Pozzo di San Patrizio in 1712 by the Camera Apostolica are commemorated in an inscription over the southern entrance of the well. Most of the building was destroyed in 1831, however, and in 1888 the exterior moat was filled in to make way for the funicular. Arranged as a public park with an open-air amphitheatre for performances, on June 19th 1882 this was the spot where the funeral of Giuseppe Garibaldi was held. Today the Rocca is used as the townï¿½s public gardens.